Here we are, at the airport, waiting to board our flight. I wanted to type out this blog while our family vacation is still fresh in my mind. The reason I feel rushed to do this is because I have received many requests to share my experience with you and many specific questions I would like to cover for you because it looks like some of my Insta Fam will be vacationing at the same resort or you are getting ready to head out to your own family vacations soon. Wherever you may be heading, I am hoping you'll find all this information helpful. This year, like the year before, we vacationed at the Bahamas, specifically, Paradise Island, The Cove Hotel. The resort is not all inclusive and boy can things add up, but from what I have heard, that's pretty much the case with most resorts. Being that we stayed at The Cove, we get access to amenities like all the water parks and extra pools from other Atlantis hotels. And if you are staying in any hotel in the resort, you also get access to all beaches, restaurants, and fun activities for yourself and kids. Plus, there are meal packages you can pay for if you're interested. There are so many other resorts and vacation spots we would like to venture to, but the reason we went back to the same resort is because my kids loved it, and it’s a great place for families with kids of all ages. My husband and I like to relax on the lounge chairs while our kids swim. They love the waterpark, the lazy river, and the fact that the beach is within 10 steps from the pool. 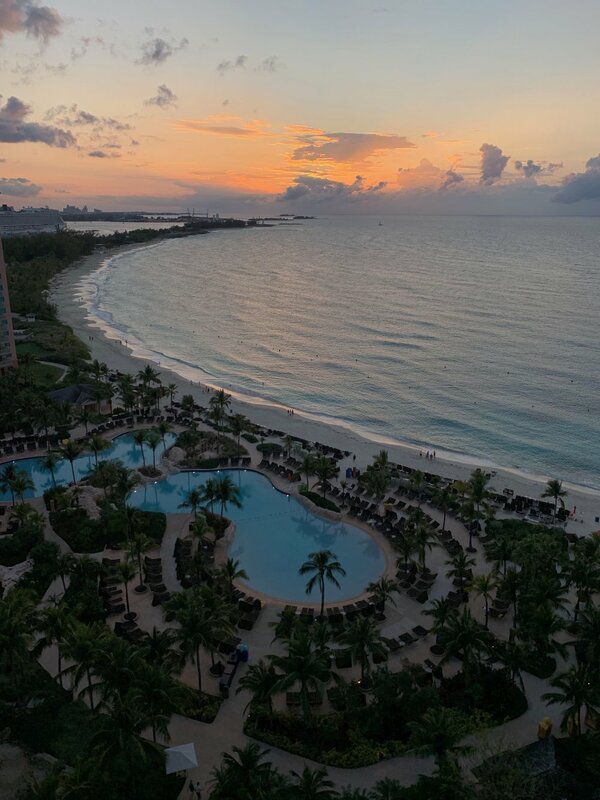 Every evening, we have dinner and walk around the resort to a beautiful breeze and breathtaking scenery of sunsets and the sound of beach waves which I shared with you on my Instagram page.If I had to choose my favorite highlight, it would be these moments, where we would talk, tease, and laugh as we walked through Paradise Island. I also love that all the hotel rooms offer a beautiful view of the beach and pool. The Marina, which is about a 10 minute walk from our hotel, allowed for some fun shopping and local boutiques. It also offered great restaurants, a candy shop, and ice cream of course! In the evenings, the vibe is upbeat, as you walk past couples and families enjoying themselves after a long day of swimming and playing. During certain days, at 9pm, the local dance group will perform a tribal dance for onlookers at the Marina. During the day, there are so many activities you can participate in like swimming with the dolphins, snorkeling, swimming with sharks (NOT FOR US), renting a boat or jet skis, and so much more - but you don't have to spend money to have fun at the resort. The kids loved walking on the beach and picking out sea shells for their collections. There are lots of aquariums to enjoy for free too, rock climbing, the lazy river and waterparks, and more. There is also child care for all ages if you're looking to have a night out with your partner which we didn't use so I can't speak to that experience. Leaving the resort, we love stopping by the Straw Market and shopping all the local handmade goodies. 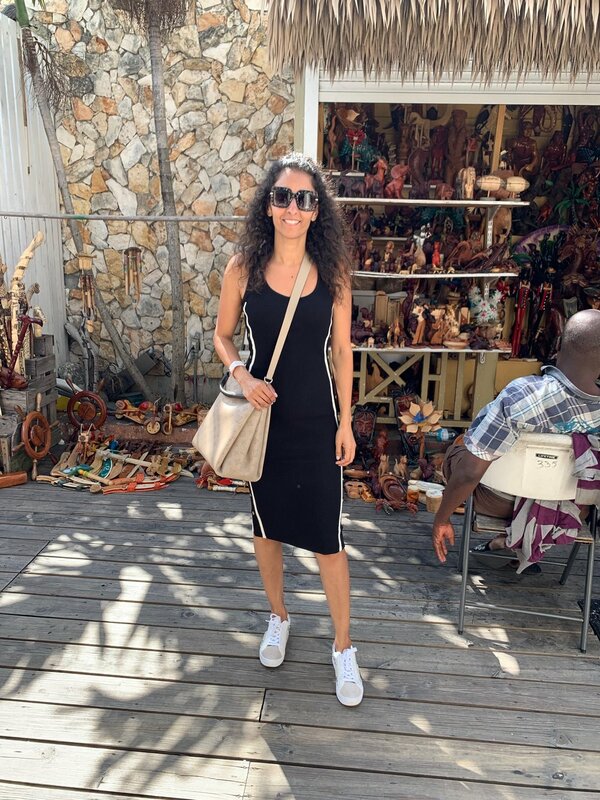 This part of our vacation takes me back to when I lived in Africa, Congo and my friends and I would shop our local markets, bartering with the shop owners, and finding beautiful, unique treasures among the local vendors. You would think, the idea of going on a vacation would mellow them out and get them to behave like grateful human beings, but who are we kidding? I keep forgetting that whining, fighting, arguing, and complaining does not pause when on vacation. If anything, it gets more intense. And in comes the "Farah Stare". You know you're in trouble when that happens. For my 10 year old and 13 year old, I had them each pack a book to read on the plane to keep them entertained. I grabbed a coloring book, sticker book, and iPad for my 4 year old. When we get to the airport, I have them each pick out 2 snacks from the airport store to enjoy during the flight. It’s the little things that get them excited for the trip, and hopefully will keep them quiet for us. All that is fine and dandy but let me tell you, if this trip taught me anything, it’s that preparing what you pack for your trip is beyond essential. I shared on my Instagram Stories with you that I tend to pack half a pharmacy and everyone's favorite snacks in a dedicated suitcase. Why? Because: 1. I want to avoid having to pay 10 times the cost of a potato chip bag and 2. If anyone gets sick, I want to be fully prepared. When it comes snacks, I am not going to pretend like my family is perfect and we only consume healthy snacks…we like to indulge in snacks like Oreos®, Lay's® chips, Gold Fish®. and Cheez-Its®. Our kids still have to have their vegetables and fruits of course. My son is 4 and we probably overstretched it this year but we took a stroller for him. Best decision ever because he would not have been able to walk all that distance with us and we would have had to turn back early on. With multiple family members getting sick with congestion and cough, the medicine we took with us came in handy. We even had to label our bottles so no cross contamination happened lol. On the fourth day, Celine woke me up at 5am scared to death because her whole face had swollen up. Luckily, my husband is a physician and he concluded it was an inflammatory response from the sunburn. He gave her Motrin which is an anti-inflammatory and smothered Aloe Vera Gel on her face throughout the day. Where would we have gotten our hands on these at 5am? She got better by the evening that day. PHEW! When it came to clothing, I packed with me clothes for our evening dinners that were dressy but also made sure I had a few outfits that would be comfortable if I needed them. Those were perfect when I got sick. Trust me, I was not in the mood to dress up when my whole body felt like it was falling apart. I also packed fun cover ups for my bathing suits and sunglasses for our walks. What I found was most helpful was having my sneakers with me, which helped with our long walks during the evenings, and my jean jacket for when it got slightly windy or chilly when the sun set. The weather was gorgeous during the day - hot and humid - which is what you want when you're laying by the pool or beach. In the evenings however, you get a beautiful breeze which will make you want to cozy up in a light sweater with shorts or just layering with a light denim jacket. The same goes for your kids - nothing major and I wouldn't say it gets cold, just a light breeze. Also, they tend to have the AC on full blast when you're in the restaurants eating, so those layers will be appreciated by you and your kids. I had such a wonderful time relaxing and enjoying spending a vacation with my family. The Cove is a favorite of ours, and we are already looking forward to going back again! Where are you heading for your next vacation? Let me know in the comments what you are looking forward to the most on your next vacation!